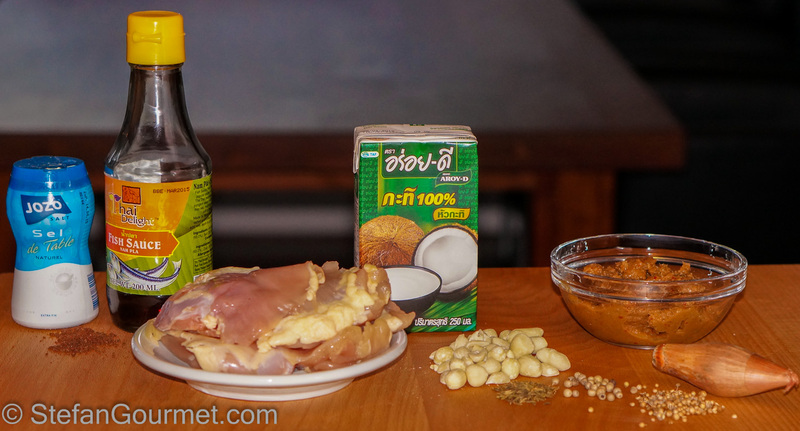 Once you have basic Thai red curry pasten (Kaeng Kua), you can easily turn it into an ‘advanced’ curry paste such as Kaeng Panang, which is enriched with peanuts and spices. 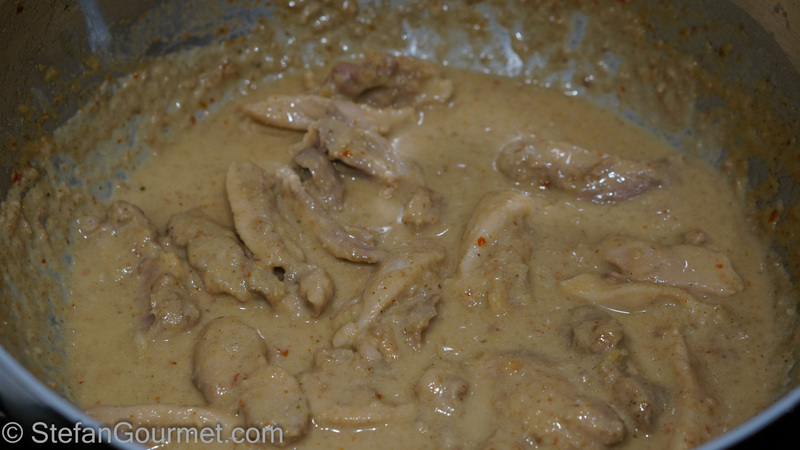 Kaeng Panang is eaten with meat and poultry, and is supposed to be a thick curry rather than a soup-like curry. 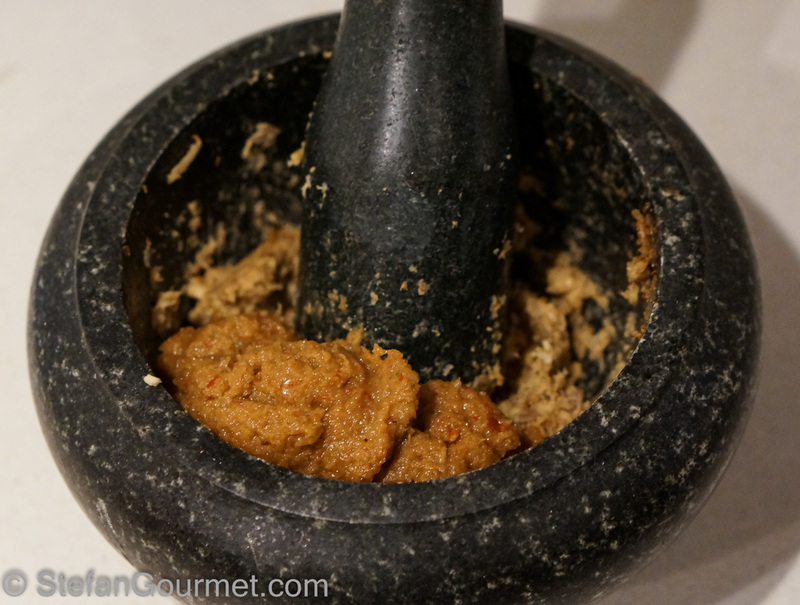 Check out The High Heel Gourmet for more about advanced curry paste. 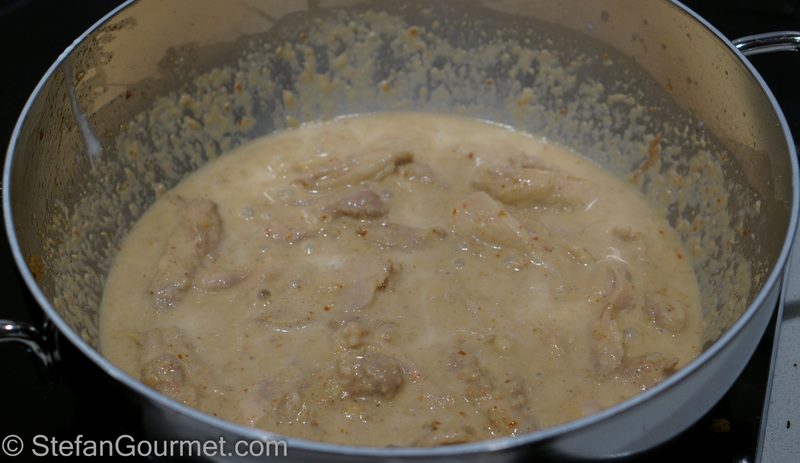 I tried my first Kaeng Panang curry with chicken, and really liked it. 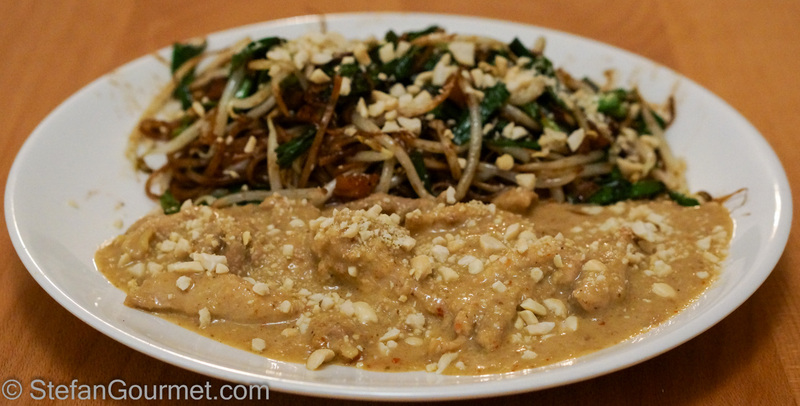 I served it with pad thai noodles on the side, which is probably not traditional but it was a good combination. 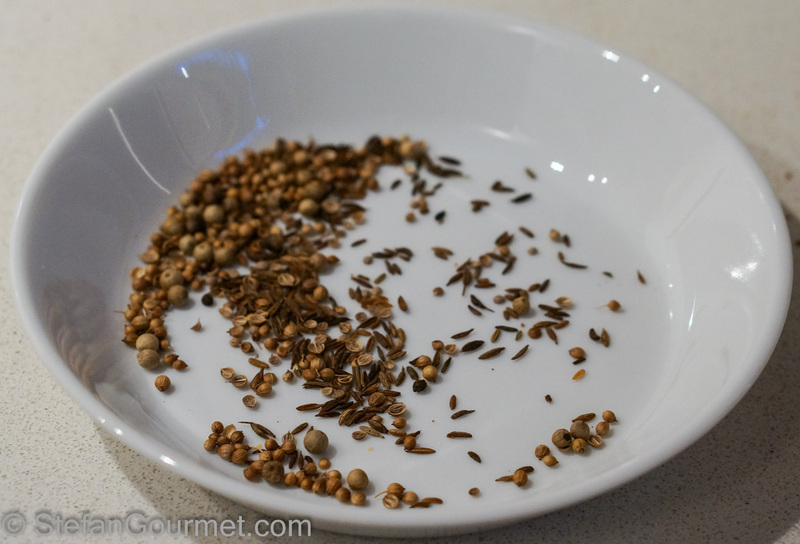 Roast the white pepper, cumin, and coriander for 5 minutes at 180ºC/350ºF. 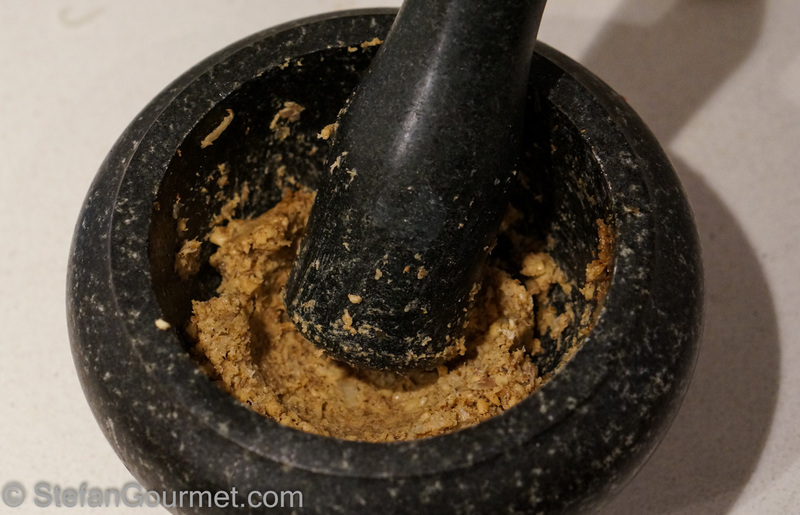 …and grind them into a pouder with the pestle. 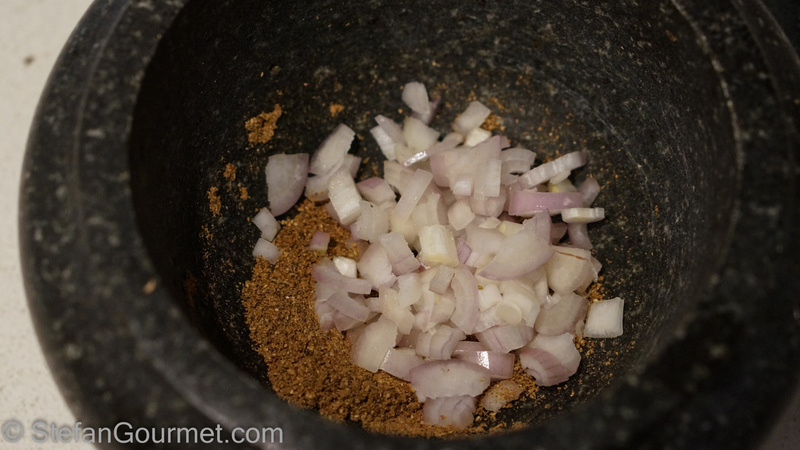 Add the shallots and pound them into pulp. 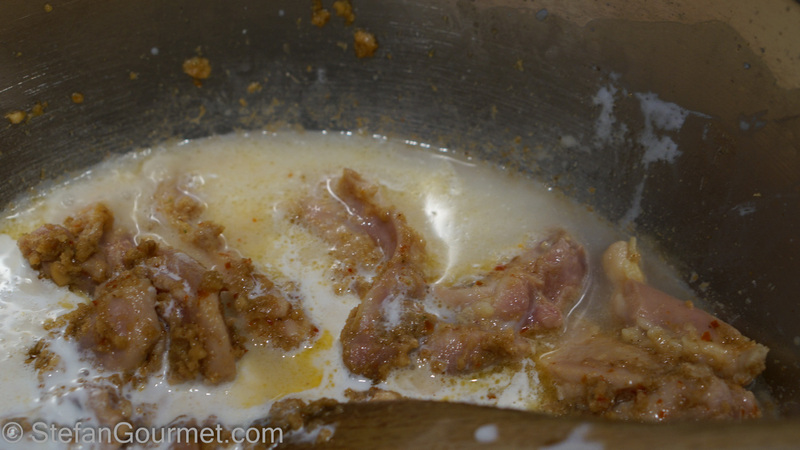 …and pound them into a coarse puree as well. 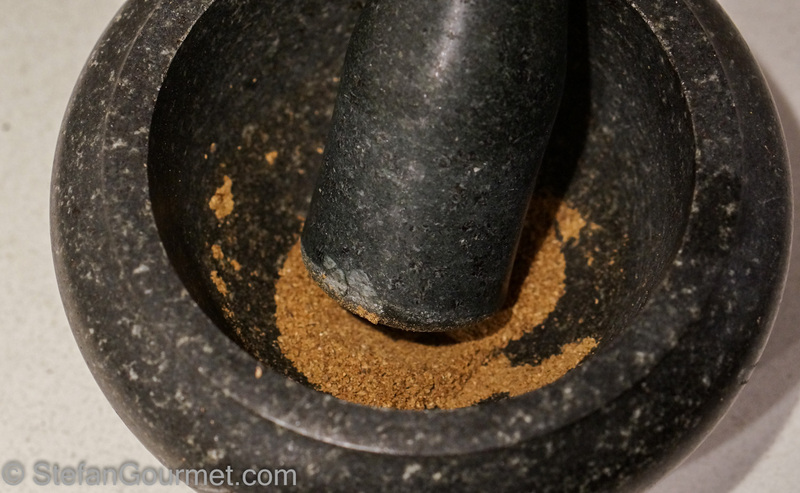 …and mix it in. 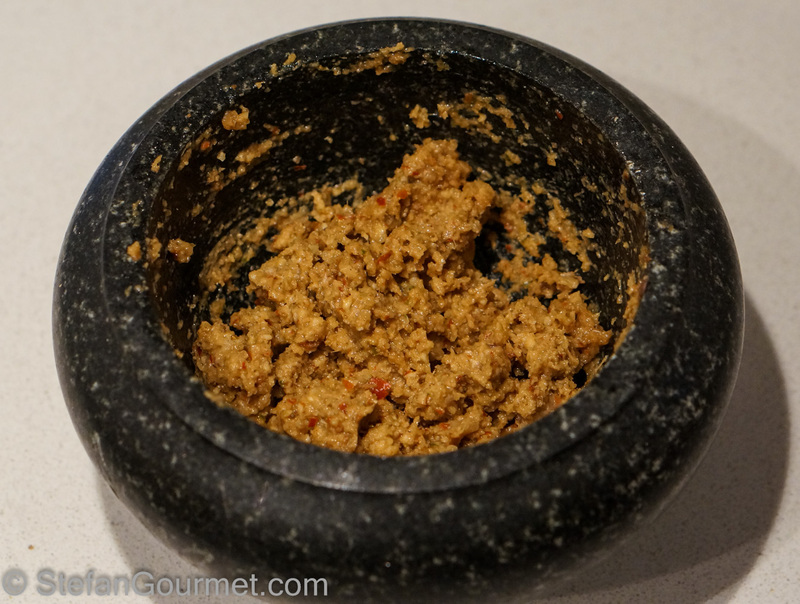 Your Kaeng Panang red curry paste is ready! 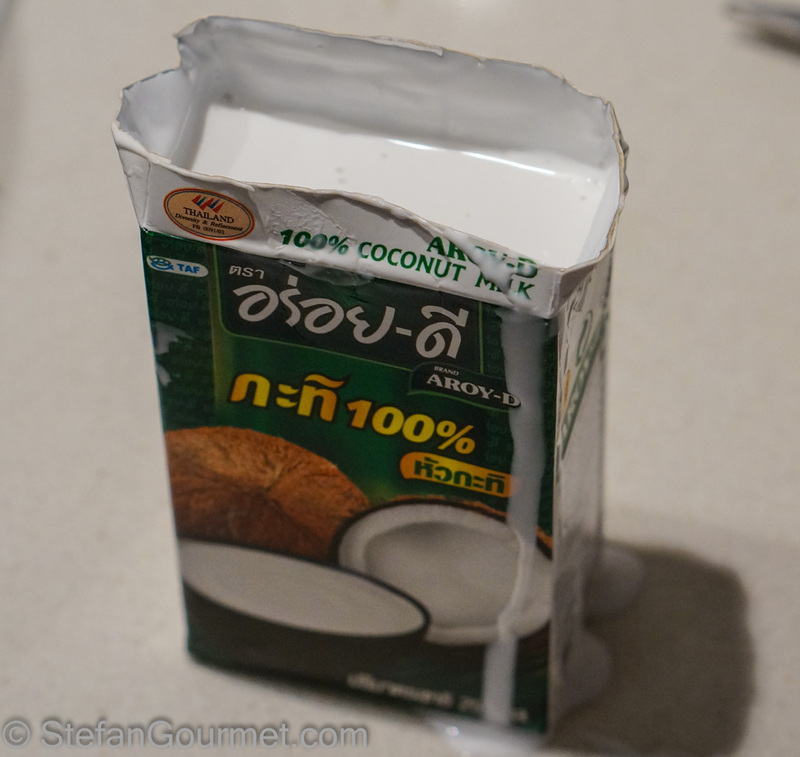 The coconut milk should have the thick white layer of coconut cream on top (with the coconut water underneath). 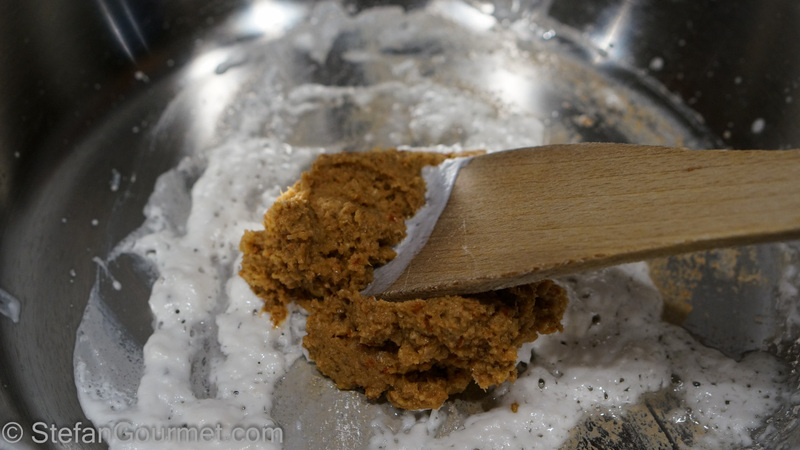 Heat up just the thick white coconut cream until it starts to separate. 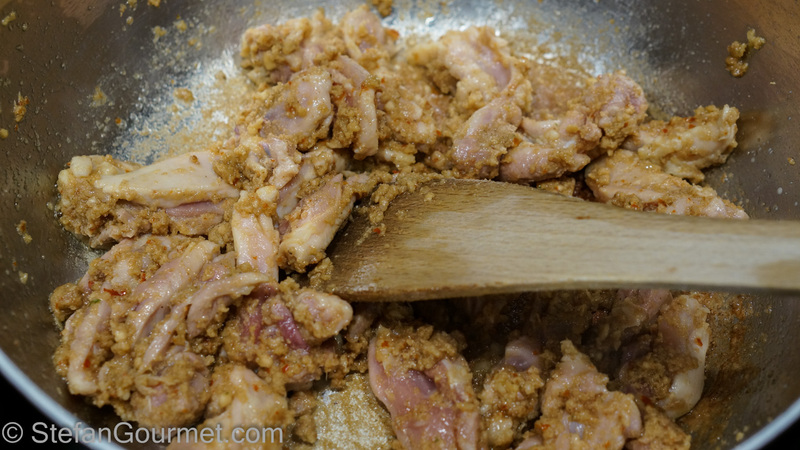 Stir the chicken for a minute until you see no more pink and it is coated with the curry. 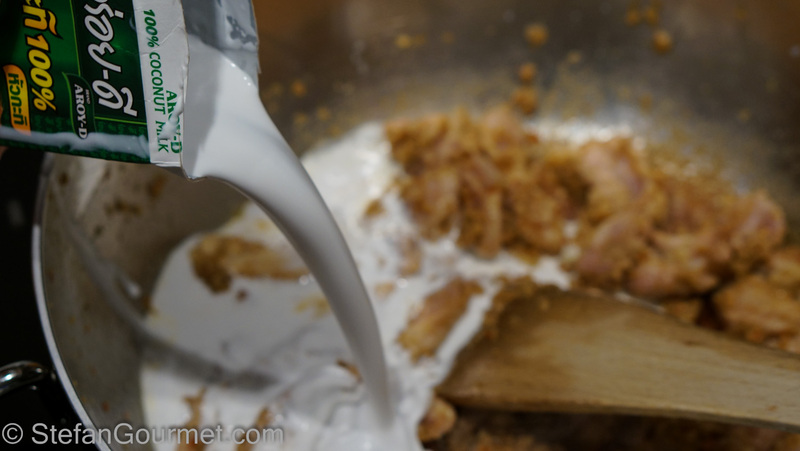 Now add the remaining coconut milk (mostly coconut water). Here you can see how watery it is. 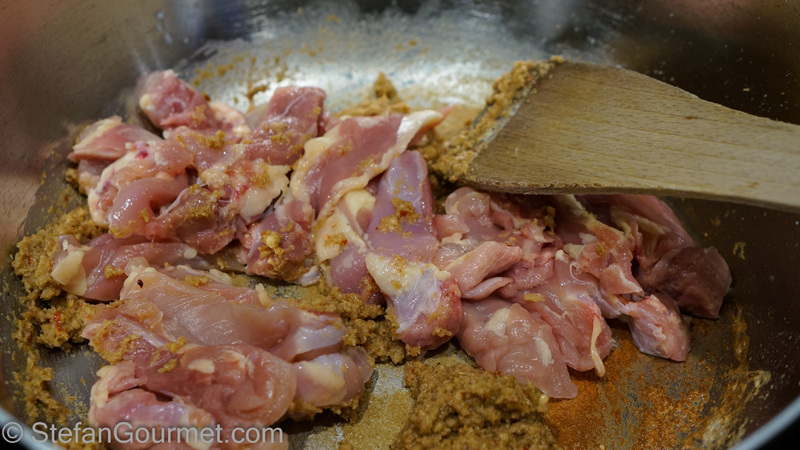 Then lower the heat and simmer until the curry has thickened and the chicken is tender. 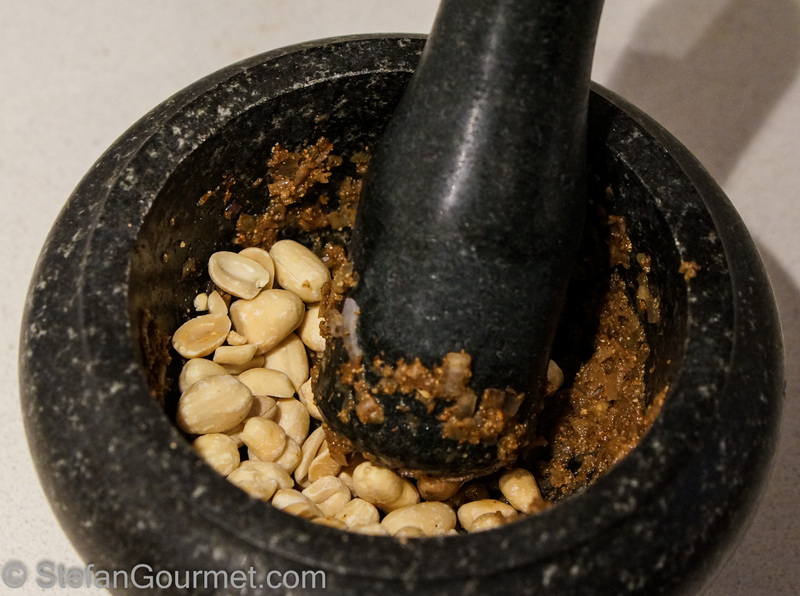 Serve with the remaining peanuts, crushed, or chiffonaded kaffir lime leaves. 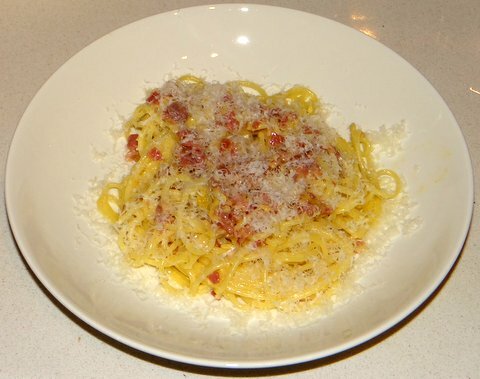 Two years ago, I blogged about spaghetti alla carbonara. This delicious dish from Rome has a low number of ingredients and is quick to prepare, but does require some practice to cook just right. 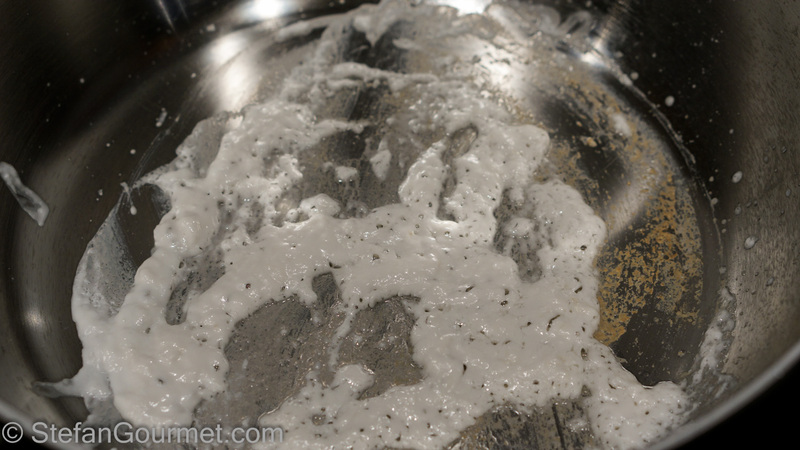 Carbonara should not be made with cream, which is a giveaway for Italian restaurants that are not really Italian. Appetizing dish I’ll certainly copy exactly! Am not particularly fond of soupy curry dishes actually .Methinks plain hokkien noodles plated under or rice [brown in my case] in the same said manner! Hope you have had a pleasant Easter 🙂 ! Thanks, Eha, hope you’ve had a great Easter, too. Wonderful instructions. 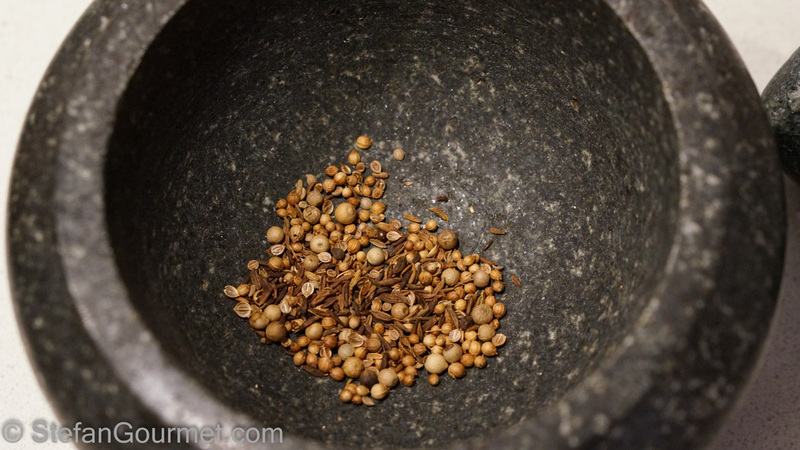 I love this recipe, and you’ve really provided an excellent tutorial. Thank you! You certainly didn’t disappoint, Stefan. This sounds like a great dish, and really isn’t at all difficult to prepare Translation: Even I could make this.